The abrupt DC system voltage drop that accompanies engine starting can cause microprocessor-based voice and data transmitters to “dump” programmed memory. 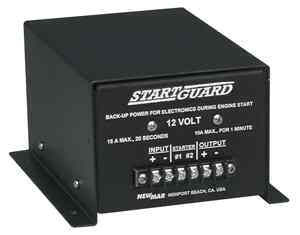 StartGuard solves this problem by providing supplemental voltage to sensitive electronics while the engine is cranked. It contains a sealed rechargeable battery which is switched on-line to electronics when the starter switch or solenoid is engaged. When the engine is running StartGuard automatically goes off-line and the internal battery is recharged by the alternator.